If you know and love Nuxe, there really isn’t much we can say to reinforce what you’ve already experienced for yourself. If you’ve yet to give the brand a try, you might want to do so after reading our editor’s review of the newly-launched Crème Prodigieuse® Boost range. If you’re juggling a full-time job, a side project, a family, social circle, home and hobbies, and don’t feel like you’re drowning underneath it all, please write a book and share your sorcery with the rest of the world. However, if, like most of us, this isn’t the case and you go through life multitasking to the point of exhaustion, listen up. Your body and your skin is exposed to high levels of stress, too little sleep and the harmful effects of the urban environment (think pollution, smoke and radiation) every day. For your skin this means oxidative and cellular stress and collagen damage, which results in accelerated signs of ageing, a dull and lacklustre complexion, loss of moisture and heightened sensitivity. 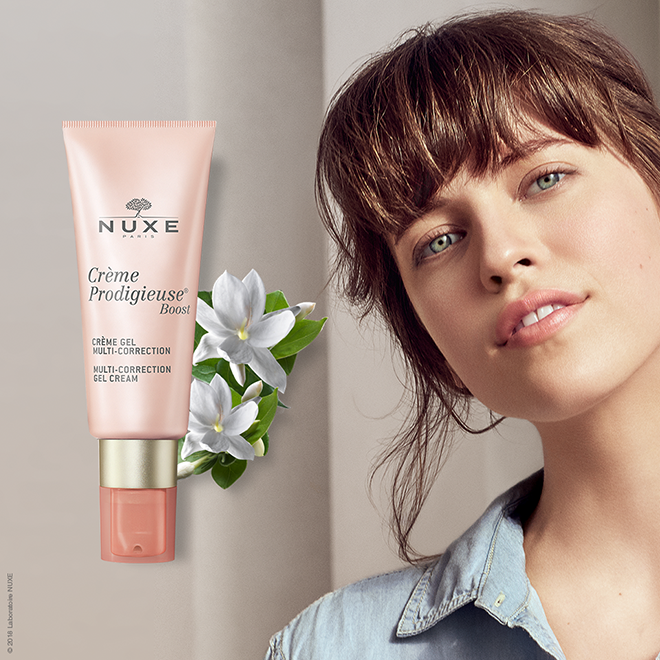 To combat the effects of modern day living, Nuxe designed Crème Prodigieuse® Boost – a range of skincare products with a multi-correcting action on the harmful effects that stress, fatigue and urban living have on the skin of 25 – 39 years olds. The range contains Jasmin Flower for its antioxidant properties, Calendula Flower and Cellular Sugar which boosts the skin’s mechanisms to self-correct the damage that’s been done. 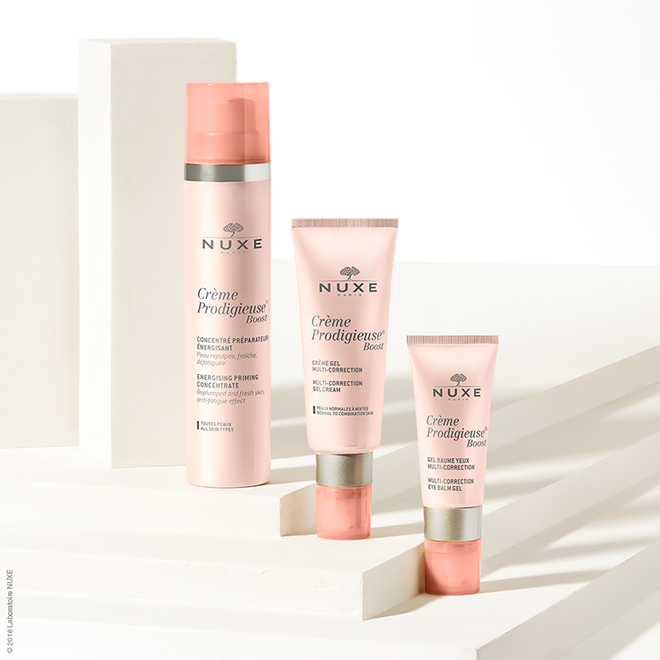 “The opportunity to test this latest range from Nuxe came at the perfect time. I’ve been putting my skin through a lot recently, and it shows. Late nights, working long hours and finding a billion things to stress about means my skin’s been looking lacklustre and dull – and having turned 30 last year, the fine lines I’ve managed to avoid up until now are finally starting to make their appearance. With Nuxe products containing mostly natural ingredients, I wasn’t sure what to expect in terms of efficacy. I’ve been using the eye cream, concentrate and gel cream for over a month now and have to admit that the results are somewhat different to what I expected. With a lot of the natural products I’ve tested in the past I’ve found that they have a peculiar scent I didn’t like, and that I didn’t see results as quickly as I have with other non-natural products. So first impressions first – this may just be the best smelling product range I’ve ever encountered. It’s so good, that it feels like applying perfume to your face (I promise that’s not an exaggeration!). Secondly, the texture of the products is really beautiful. All three products I used melted into my skin with hardly any effort from my side and there was no sticky residue whatsoever. The ideal primer to prepare your skin for your treatment cream application, this serum-lotion with its revolutionary texture inspired by Korean liquid cosmetics combines 2 types of natural Hyaluronic Acid. With a complementary action, these offer a visible smoothing effect while moisturising deep down. Vitamin C activates the skin’s radiance. With its delicate, ultra-refreshing texture, this gel balm diffuses a Botanical Caffeine extract, with anti-dark circle and anti-puffiness properties in the eye contour area, to counter the effects of an insufficient night’s sleep in the blink of an eye. Hazelnut Oil, chosen for its lightness, helps strengthen this fragile area. Crème Prodigieuse Boost Multi-Correction Gel Cream – R495.00 (40ml) Normal to combination skin Crème Prodigieuse Boost Multi-Correction Silky Cream – R495.00 (40ml) Normal to dry skin Combining the Jasmine Flower antioxidant complex with the smoothing effect of natural Hyaluronic Acid, this is the daily booster for revived fresh, radiant skin, while softening the first signs of ageing. Available in 2 textures: a gel-cream with an incredibly light matte finish for normal to combination skin, and a velvety silky cream version for normal to dry skin. Available at Truworths, Woolworths and select Edgars stores, online at www.absoluteskin.co.za.